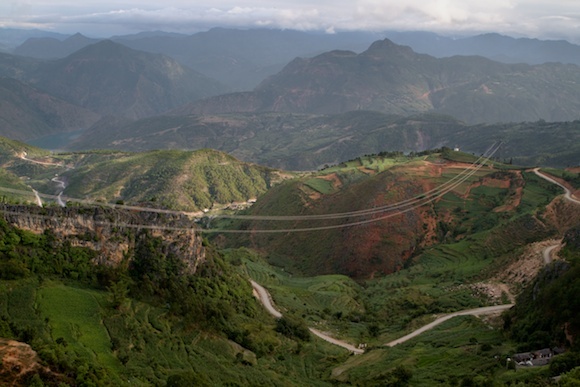 Power cables run across a valley in the remote mountains of Yunnan Province, China. Far in the distance a part of the reservoir of the Xiaowan Dam is visible. After ending up at the wrong dam yesterday, we took to road early today to reach the Xiaowan Dam in the morning. We still had a seven hour drive back to Kunming ahead of us. After heading back for half an hour on yesterdays road from the Manwan Dam we found the right turn to a mountain road leading to the highest arch dam of the world. Another one and a half hour on surprisingly good tarmac led us across a mountain rim with alternating views of the downstream Lancang River on my left and the reservoir behind the dam on my right. The last part wound along a steep curving cliff with the river deep below me on my left just to be halted by a military gate blocking all views behind it. This was the end for us. The whole dam area is a restricted military zone. No foreigners or cameras allowed. I kept pushing my translator to ask around until some local workers told us about two American journalists that attempted to hike through the mountains to see the dam. They were arrested by the army and deported. “The whole area is guarded. There are no points from where you can see the dam, only the river,” we were told all the time. Frustrating is that I have seen pictures on the internet. Chinese citizens are allowed into the zone and some have secretly taken some photos anyway. So we turned around, disappointed. I could only think how fortunate it was that we ended up at the wrong dam yesterday. If I would have arrived here yesterday I don’t know if I would have thought to go to the Manwan dam since I never realized they were so (relatively) close together (a little more than 3,5 hrs driving apart). Nine hours later I arrived back in Kunming, without any pictures of the Xiaowan Dam, but at least with some nice images of the upper Mekong, locally called the Lancang River and at least having visited one of the four dams that cause so many problems downstream, according to the Cambodians and Vietnamese.